Who says that you must give chocolates, flowers or unwanted trinkets on Valentine's Day? We recommend showing that special someone in your life how much you appreciate them and how unique you think they are by giving a ring by Violet Darkling. 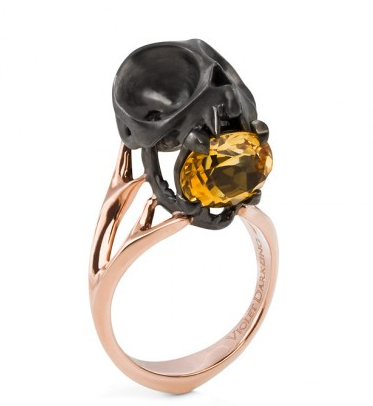 Our favourite is the Tarsier Ring modelled on the skull of an actual Tarsier which is a primate from the Philippines. Black rhodium plated sterling silver and gently holding a citrine in it's jaws, this piece says more than any heart shaped box or a dozen roses ever could.